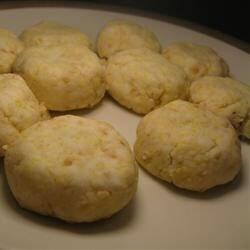 "These plump little almond cookies are easy to make and call for ground peanuts, corn flour, and vegetable oil. " Stir together the peanuts, flour, corn flour, and confectioners' sugar in a large bowl until well-combined. Make a well in the center of the peanut mixture. Slowly pour in the vegetable oil and mix with the peanut mixture to make a wet, slightly sticky dough. Pinch off about 2 teaspoons of dough per cookie, and roll into balls about 1/2-inch in diameter. Place the balls on the prepared baking sheets, and brush each with egg yolk, if desired. Bake in the preheated oven until the cookies are golden brown, 6 to 8 minutes. Let cool on racks.